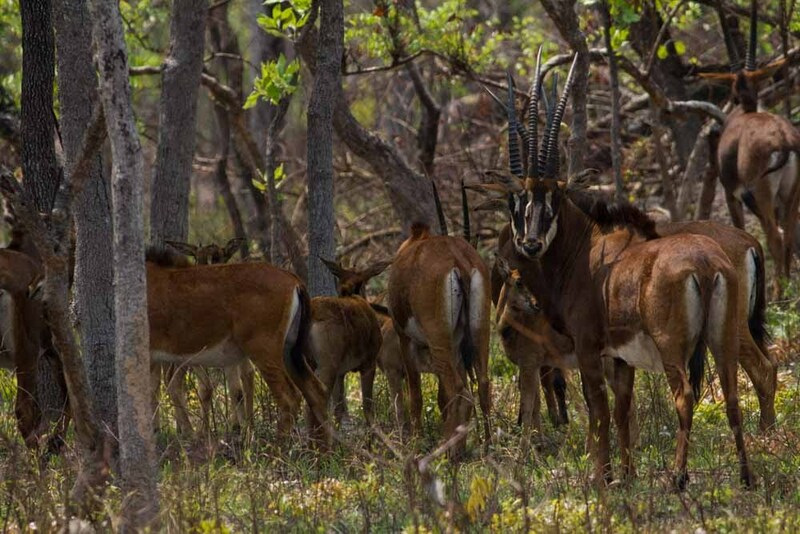 Read Biologist Pedro Vaz Pinto’s Second Semester 2017 Report with photos of Angola’s Cangandala Park and Luando Reserve, in English and Portuguese, now on our Giant Sable page. Ivan the Terrible in 2011. He was so strongly built the radio collar looks dwarfed around his neck. Visit our Giant Sable page to read Pedro Vaz Pinto’s full report. 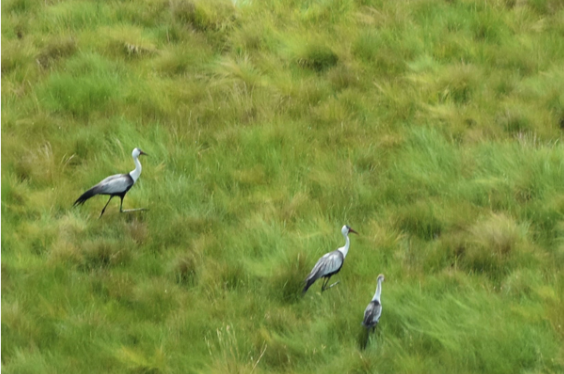 The International Crane Foundation conducted an aerial survey of Cameia National Park in Moxico and the surrounding Bulozi Plain of Angola, a massive fresh water floodplain, and discovered three new breeding grounds for Wattled Cranes. Wattled Crane families, one of the newly discovered populations. 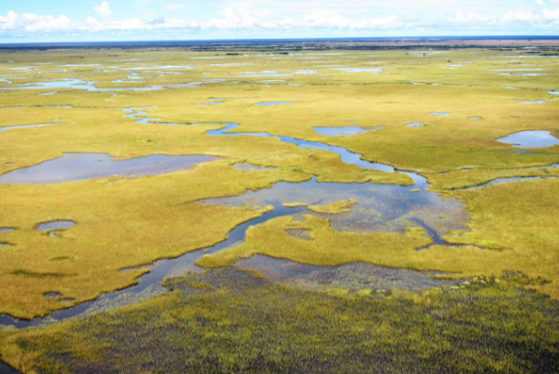 Wattled Crane habitat on the Bulozi Plain. Click here to download a PDF version of the August 2018 issue of the Foundation’s publication, The Bugle. The Angolan Escarpment is the least known and studied part of the African Great Escarpment. 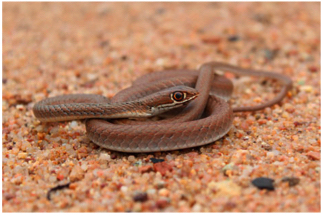 Urgent research is required to protect and conserve Angola’s threatened biodiversity. Several observatories have been implemented throughout Angola including one in the southern escarpment in Tundavala. 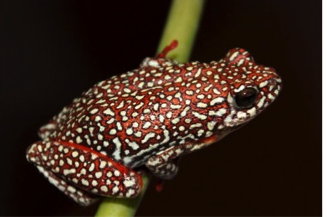 As part of this study on Biodiversity and Ecology by Hamburg University, you can now download a special report titled Amphibians and reptiles of the Tundavala region of the Angolan Escarpment, by researchers Ninda Baptista, Telmo António, and William R. Branch. Click here for the PDF. (Baptista, N., António, T. & Branch, W.R. (2018) Amphibians and reptiles of the Tundavala region of the Angolan Escarpment. In: Climate change and adaptive land management in southern Africa – assessments, changes, challenges, and solutions (ed. by Revermann, R., Krewenka, K.M., Schmiedel, U., Olwoch, J.M., Helmschrot, J. & Jürgens, N.), pp. 397-403, Biodiversity & Ecology, 6, Klaus Hess Publishers, Göttingen & Windhoek. doi:10.7809/b-e.00351). Photos taken from the article. This book can be purchased directly from the author: www.goawaybirding.com or via the BirdLife South Africa bookshop at www.birdlife.org.za. 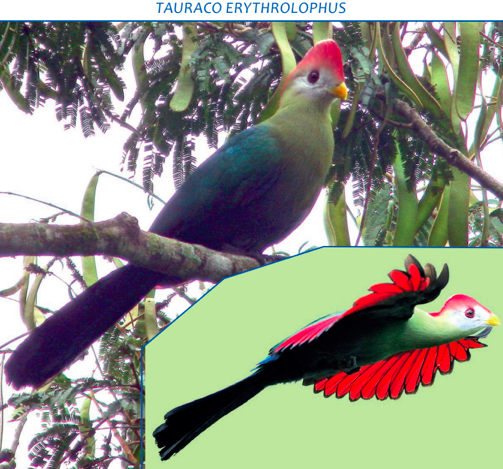 The Red-crested Turaco is the national bird of Angola. Image taken from The Special Birds of Angola. “Angola is endowed with the richest diversity of eco-regions of any African country. Its habitats range from the mobile dunes of the Namib Desert to the equatorial rainforests of Cabinda, from arid savannas of the Cunene Basin to the moist miombo woodlands of the Bie planalto, and from the floodplains of the Cuando-Cubango to the montane grasslands and forests of the Benguela highlands. It is thus not surprising that Angola has a remarkably rich birdlife, one of the richest on the continent. Despite all the natural treasures of Angola, it remains one of the most poorly researched regions of the globe. Fortunately, this situation is rapidly changing. Increasing numbers of young Angolan biologists are joining expeditions led by international experts in the study of Angola’s biodiversity. For more than a decade, Michael Mills has been working with Angolan colleagues in exploring the far corners of the country, discovering and documenting the incredibly rich diversity of birds. 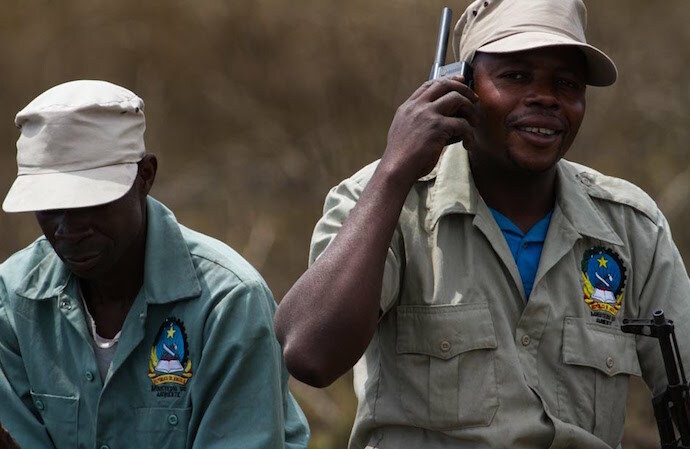 Most importantly, he has been working with the local communities of Morro Moco to protect the critically threatened forests of Angola’s highest mountain, where many bird species known nowhere else, are found. This book is a unique and major contribution to bringing the diversity and beauty, but also the rarity and vulnerability, of Angola’s avifaunal treasures to the attention of the Angolan people. By highlighting the birds of special interest to ornithologists, to conservationists, and to the general public, Michael and his collaborators have set a benchmark for promoting awareness of the importance of Angola’s avifauna and the habitats they occupy to the world at large. Without knowledge, there can be no appreciation, and without awareness there can be no conservation. As Angola’s critically important bird areas come under increasing threat, time is not on the side of the birds and their habitats. This book can help reverse the trend.” – From the Foreword by Brian Huntley to the newly published book, The Special Birds of Angola. Biologist Pedro Vaz Pinto’s First Trimester 2017 Report with photos of Angola’s Cangandala Park and Luando Reserve, in English and Portuguese, now on our Giant Sable page. Camping under the stars in the Luando Reserve. 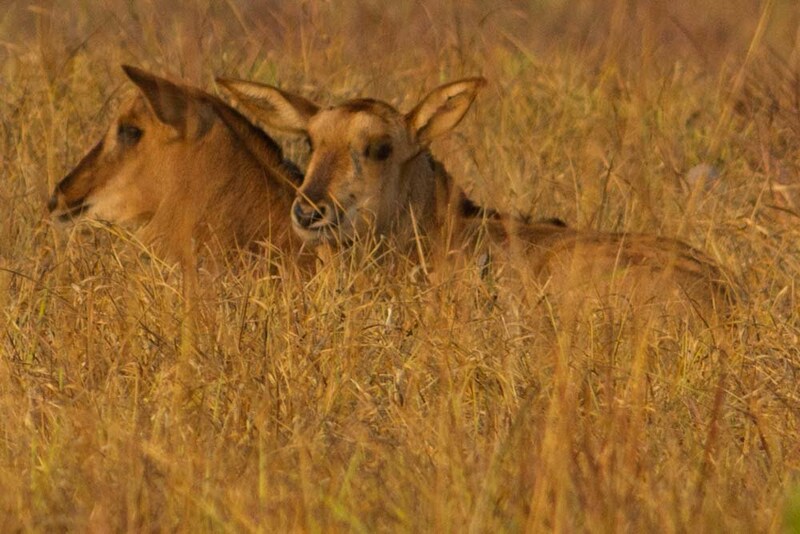 Plenty of calves suggest a very successful breeding season in Cangandala. A hunting spider preys on a grasshopper. 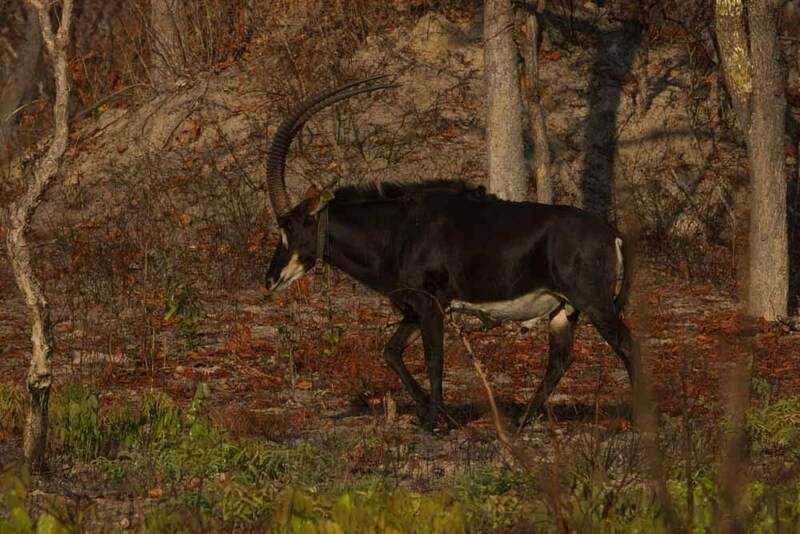 Biologist Pedro Vaz Pinto’s Third Trimester 2016 Report with photos of Angola’s Cangandala Park and Luando Reserve, in English and Portuguese, now on our Giant Sable page. Between July and August 2016 an ambitious aerial census and capture operation was carried out in Luando and Cangandala. The Angolan military participated and provided critical support. In Luando Reserve the operation was a huge success. The three known herds were located and then the two “missing” groups were also found, bringing the total of confirmed herds up to five. 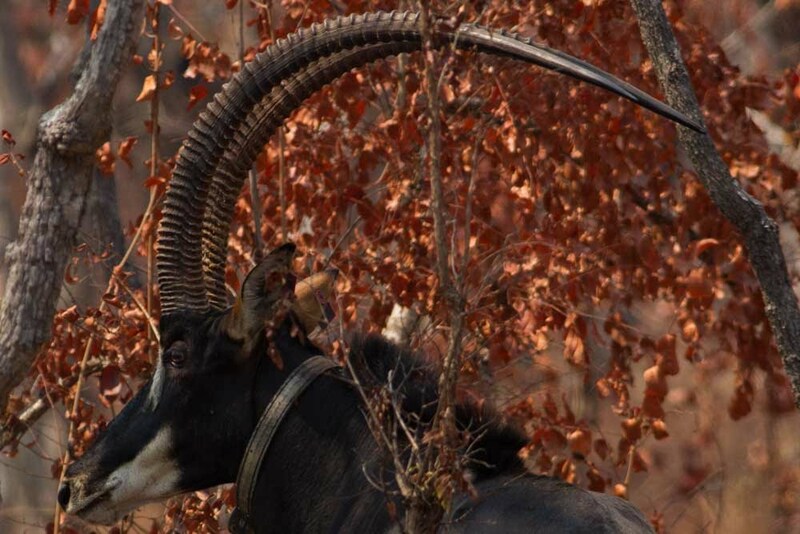 The largest giant sable herd finally located in Luando Reserve. Ngola, “arguably the most powerfully built, strongest and well proportioned bull we ever handled”, was found escorting the largest herd in Luando. In Cangandala National Park there was no need for counting the sable population as it is regularly well monitored on the ground. 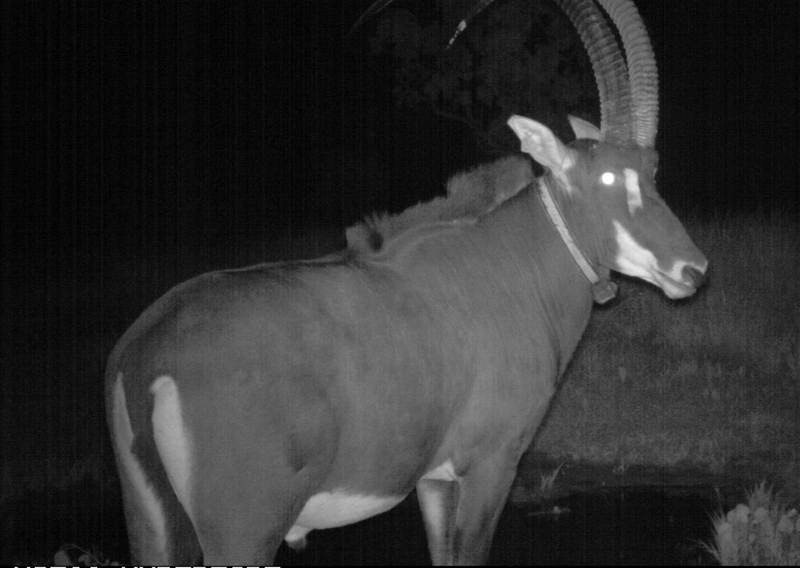 Also the poaching situation isn’t brilliant in Cangandala but at least it is fairly under control, besides the fact that with a couple exceptions all giant sables are contained inside the fenced sanctuary. Therefore the flights in Cangandala were done mainly with the purpose of capturing at least a couple young males and put them VHF collars. A big surprise in Cangandala was coming across a young male forest buffalo which was clearly seen and photographed. Another big surprise, Ivan the Terrible was found and darted outside the fence in Cangangdala! The slide show below shows evidence of snare-type poaching being carried out especially in the Luando Reserve. Visit our Giant Sable page to read Pedro Vaz Pinto’s full report with more photos, and previous reports. 2017 reports to be posted soon. Hot off the press, a new book published about wild Angola, now available from Protea Publishing and Amazon. Angola was once one of Africa’s last great wildernesses. Gorillas and chimpanzees shared the pristine rainforests of Cabinda, giant sable antelope roamed the miombo woodlands of Luando, and the enigmatic Welwitschia mirabilis crowded the plains of the Namib. But war, intrigues and arrogance have resulted in the loss and near extinction of most of Angola’s formerly abundant wildlife and the decay and erosion of a once endless Eden. From 1971 to 1975, author Brian J. Huntley was ecologist for Angola’s five major national parks, surveying the entire country and developing the country’s conservation strategy. Integrating the historical, political, economic and environmental threads that account for Angola’s post-colonial tragedy, Huntley describes in detail the wildlife, wild places and wild personalities that have occupied Angola’s conservation landscape through four decades of war and a decade and a half of peace. Despite the loss of its innocence, Huntley believes that Angola can rebuild its national parks and save much of its wildlife and wilderness. Author Brian J. Huntley gave a presentation to the Angola Field Group on December 2011. Following retirement in 2009 as CEO of the South African National Biodiversity Institute, he is currently an independent consultant on conservation research and implementation projects in many African countries for various United Nations agencies. He is also a Research Associate at the Centre for Invasion Biology at Stellenbosch University and an Emeritus Professor at the University of Cape Town.